If you want to look like a walker from the number one hit AMC show The Walking Dead, then you must get your hands on this officially licensed Walking Dead Make-up kit. 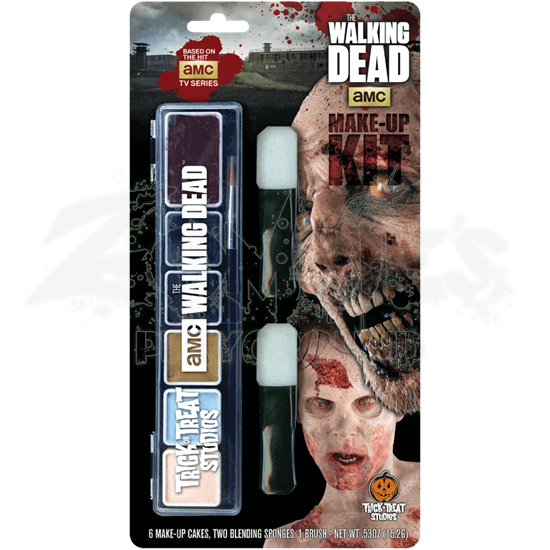 This kit is the easiest way to transform into a gruesome walker. Each of the six colors was methodically chosen to match the color pallet that is used on The Walking Dead. The kit includes six make-up cakes, one brush, and two sponges, giving you all the tools you need to complete your walker look. This zombie make-up is water activated, so it is easy to apply and remove using a small amount of warm water. It is incredibly comfortable to wear and the detail will last all day while resisting smudges and blurring. Pair this make-up with some torn up clothes and you can have a fantastic zombie look!